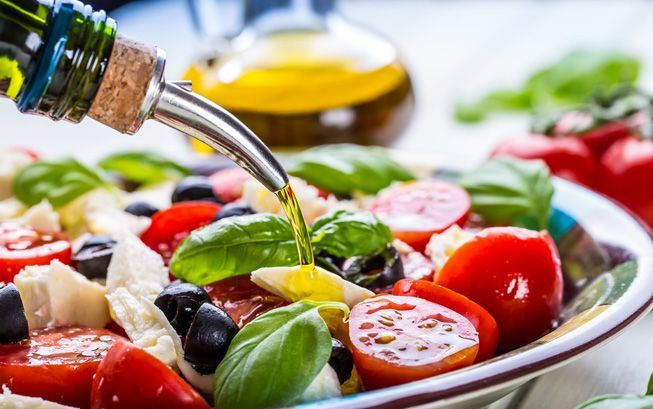 What is the Mediterranean Eating Plan? Swap out most of your red meat and get your protein from skinless chicken and turkey, fish, beans, nuts and other plants. By displacing red meat, you’ll lower your saturated-fat intake. Start by making a few small changes. Aim to eat fish of any kind—except for fried, of course—twice a week. 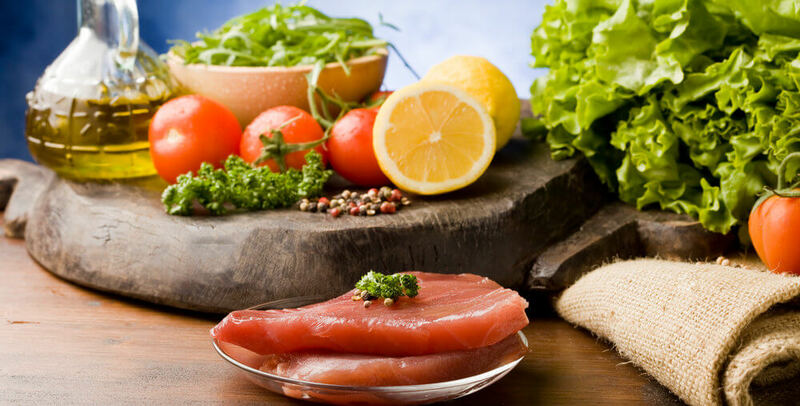 Fatty fish, such as salmon or tuna are especially good choices: they are rich in omega-3s, a type of polyunsaturated fat, linked with improved heart health. If you do have a hankering for a steak, it’s OK to indulge—just do so occasionally, choose a lean cut like sirloin and limit your portion size to the palm of your hand. Most people don’t get enough! Aim for 3 to 8 servings of vegetables a day. A serving size is 1/2 (starchy) to 1 cup (most) and 2 cups (green leafy veg). Pick vegetables in a variety of colors to get a range of antioxidants and vitamins. Start your day out with a spinach and Cheddar omelet, have a bowl of vegetable soup for lunch and have roasted carrots and a green salad for dinner. Big green salads are a great way to include several vegetable servings at once, so treat yourself to one daily. Snack on a handful of almonds, walnuts or sunflower seeds (watch those portions) in place of chips, cookies or other processed snack foods, which are often loaded with sugars, saturated fat and trans fats. Calcium-rich low-fat cheese or low-fat and nonfat plain yogurt with fresh fruit are other healthy and portable snacks. Generally a good source of fiber, vitamin C and antioxidants, fresh fruit is a healthy way to indulge your sweet tooth. Keep fresh fruit visible at home and keep a piece or two at work so you have a healthful snack when your stomach starts growling. Lots of grocery stores stock exotic fruit—pick a new one to try each week and expand your fruit horizons. Research indicates that people who drink moderately are less likely to have heart disease than those who abstain. Alcohol appears to raise “good” HDL cholesterol. Wine, in particular, “thins” the blood (making it less prone to clotting) and also contains antioxidants that prevent your arteries from taking up LDL cholesterol, a process that can lead to plaque buildup. Remember, “1 drink” equals +/- 330ml of beer, 100ml of wine or a shot of liquor.